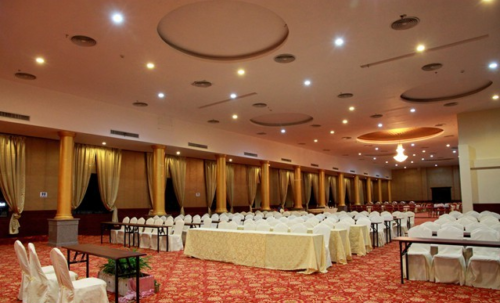 GGI Hotel Batam is an affordable 4-star city hotel on Batam island. Our offer on GGI Hotel Batam Package includes 1-night stay with breakfast, 2-way ferry tickets from Singapore, 2-way Batam land transfers, and option of Batam tour with seafood lunch and body massage. Location is one of GGI Hotel’s main strengths. It’s just 5-minute drive away from the Harbour Bay Ferry Terminal and 10 minutes from Nagoya Hill area. Other hotels in the Harbour Bay district are Pacific Palace Hotel Batam, Zest Harbour Bay Hotel Batam and Swiss-Belhotel Harbour Bay Batam. GGI Hotel Batam is for anyone who wants a 4-star hotel with a 3-star price. GGI Hotel guests are made up of leisure and business guests, individual or group. Many business individuals or groups in this hotel come domestically from Medan, North Sumatra. Besides the sought-after location, GGI Hotel Batam has the expected amenities of a 4-star hotel. 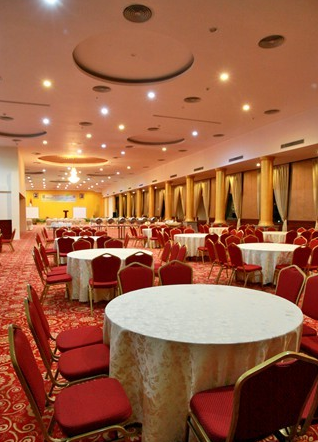 It has a fitness centre, swimming pool, karaoke rooms, ballrooms, and more. It really caters to guests with diverse preferences and backgrounds. GGI Hotel Batam applies the same rate across weekdays and weekends. On some public holidays, it has some surcharges. Get the best GGI Hotel package with ferry and tour, or a just a hotel with ferry package from us. Hotel is located near Harbour Bay Ferry Terminal and shopping mall. It’s so cheap to watch a movie there, I only paid 35,000 IDR per person which is equivalent to $4 per person. Hotel is slightly old looking, plenty of hotels nearby may try for others in the future.